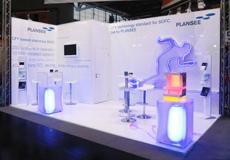 The ITM interconnect supplied by Plansee was an important component in the planar solid oxide fuel cell developed at the Jülich Research Center. While fuel cells developed for use in vehicles only have to last for between 5,000 and 10,000 hours, their cost-effective operation in stationary applications calls for a minimum life of five years, the equivalent of around 40,000 hours. The Jülich solid oxide fuel cell, or SOFC for short, exceeded this value in long-term testing for the first time in March 2012, setting a new world record in the process. This fuel cell uses Plansee ITM interconnects. ITM is an iron-based ODS (Oxide-Dispersion Strengthened) alloy with a 26 % chrome content and very small amounts of yttrium oxide (Y2O3). An ODS alloy of this type can only be manufactured using powder metallurgy techniques and offers crucial benefits in terms of SOFC high temperature fuel cell applications. ITM interconnects withstand thermal and redox cycles for longer than other types of ferritic steel. 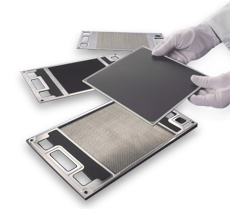 Thanks to their outstanding corrosion stability, they also ensure the particularly long life of fuel cells – an important contribution to the Jülich record stack. And get more information on Forschungszentrum Jülich and the Jülich fuel cell. A solid oxide fuel cell, or SOFC for short, is used at operating temperatures of between 650 and 1000°C. 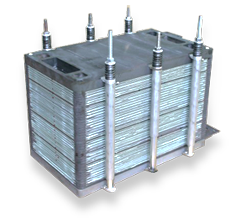 In an ASC (Anode Supported Cell) solid oxide fuel cell, the anode is the mechanically supporting element of the cell. Unlike other types of fuel cell, the SOFC is not only able to convert hydrogen to water with the help of oxygen, but can also convert CO to CO2. This electrochemical reaction results in the generation of predominantly electrical power from the energy contained in the gases. The high operating temperature of the SOFC offers a crucial advantage: Hydrogen and CO can be produced within the fuel cell system from natural gas, biogas or other gases containing hydrocarbons, by means of what is known as a shift reaction. Plansee metallic ITM interconnects connect the anode and cathode of the individual cells electrically and distribute fuel gas and air to the active areas. Several cell layers stacked on top of one another create a cell stack. The SOFC stacks are housed in a hot box which shields the rest of the fuel cell system from the high temperature and contains ducts for fuel gas, air, electric conductors and sensors. The peripheral components, also known as Balance of Plant (BoP), provide the stack module with all the requisite media. Among other things, the BoP includes a fuel gas desulfurization unit, all the control systems for fuel gas and air, heat exchangers, fans and an AC inverter to convert the direct current produced by the fuel cell into alternating current. Meet us at the Hannover Fair! Learn more about our interconnectors April 23-27, 2012 at the Hannover Fair in Germany. In hall 27, booth C70/1 our SOFC team is looking forward to meeting you.